Born: Arles, France, 13 February 1920. Family: Married Zizi (Alice) Boivin, 1947 (divorced, 1963); married Mia Fonssagriéves, 1964 (divorced, 1972); children: Dominique (also known as Kiki). Military Service: Served as lieutenant in the French Resistance. Career: Opened first couture boutique in Cannes, 1955; moved to Paris, entered ready-to-wear, 1956; first menswear line launched, 1975; costumer designer for films and television; perfumes Justine, introduced, 1965, Corrida, 1975; Fantasque introduced (and later licensed to Avon Products), 1980, Fer (also licensed to Avon, but under the name Féraud pour Homme ), 1982; Jour de Féraud/Vivage, introduced, 1984; sportswear line introduced, 1989; New York flagship store opened, 1990; accessories line introduced, 1992; retired, giving control of business to daughter Kiki and former wife Zizi, 1995; ready-to-wear division sold to Secon; remaining business units sold to Secon, 1999; Yvan Mispelaere hired as designer, 2000. Exhibitions: Exhibition of paintings in Paris, 1988, 1989, 1992, 1993, 1994, and in Japan, 1989; Gallery Urban, New York, 1990. Awards: Légion d'Honneur; Golden Thimble Award, 1984; Dé d'Or Award, 1978, 1984. Died: 28 December 1999, in Paris. Company Address: 88, Frabourg Saint-Honoré, 75008, Paris, France. 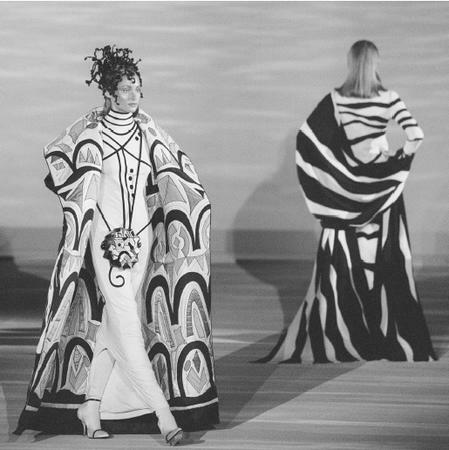 Louis Féraud, autumn/winter 1999-2000 haute couture collection. "L'éte du pingouin (The Penguin's Summer), Paris, 1978. Memoir, L'hiver des fous (The Winter of Fools), Paris, 1986. Hunter, Catherine Ellis, "Avon Embraces the Designer Fragrance," in Drug & Cosmetic Industry, September 1984. "Louis Féraud l'atout coeur," in L'Officiel (Paris), September 1984. "Louis Féraud, mille facettes," unpaginated feature in L'Officiel (Paris), September 1985. "Louis Féraud: le chic," in Vogue (New York), April 1986. Smithers, T. S., "Fast Times with Louis Féraud," in WWD, 20 October 1986. "Louis Féraud: pour fêter l'Espagne," in L'Officiel (Paris), March 1987. Guernsey, Diane, "The Other Féraud," in Town and Country (NewYork), October 1990. Petkanas, Christopher, "French Accents," in Harper's Bazaar (NewYork), February 1991. Bowles, Hamish, "Louis the Fun King," Harpers & Queen, December 1991. "Feraud, Bardot's Discoverer, Dies in Paris at Age of 79," in the Chicago Tribune, 28 December 1999. Riding, Alan, "Louis Feraud is Dead at 79; Prominent Fashion Designer," in the New York Times, 29 December 1999. Brady, James, "The Designer Who Loved Women," in Crain's New York Business , 10 January 2000. It has been said of Louis Féraud that he was a man who loves women. Indeed, he described himself as "Louis Féraud who adores women, Louis Féraud who admires women." This devotion no doubt inspired the former French Resistance lieutenant to pursue a career in the rarefied worlds of French haute couture and ready-to-wear. Féraud designed for a seductive woman who lived in harmony with life and herself, a woman looking for comfort and freedom. He was fascinated by the different personalities of women and how this inspired him to create different moods and themes. For women, he said, "Fashion is an opportunity to be chic, to conspire between reality and desire." Féraud created glamorous, luxurious clothes at ready-to-wear prices; he also designed for couture. Among his celebrity clients were Joan Collins, for whom he designed some of the clothes worn in the television series Dynasty and Madame Mitterand, wife of the former French President. His collections were divided between the prêt-á-porter Louis Féraud Paris collections and the less expensive Louis Féraud set. A strong team backed up the Féraud business, originally led by Féraud himself and consisting of nearly a dozen international designers, color specialists, and stylists who worked together to form what he described as a weather forecast that predicts trends. In addition to the suits and dresses for Dynasty, Féraud designed for the television series Dallas, for film, and for starlets Brigitte Bardot, Paulette Goddard, Kim Novak, Catherine Deneuve, Mireille Mathieu, and Sabina Anzema. Yet when asked if given the chance to design clothes for women from another era, and which era that would be, Féraud declared: "Tomorrow. I am often seriously asked what fashion will be doing next year. I am like an art medium for these people, who has the ability to look into the future." Féraud listed painting as being amongst his passions; it inspired him to develop color in his work. "Colors are fantasies of light," he claimed. "However, all colors are diffused in black, memories of the sun, the indispensable, and the perfect that is beauty." He selected specific color ranges each season, but declared himself unaffected by fashion trends. "The only thing that we must know in our business is what doesn't exist as yet." Color specs were developed within the design team, which also created new ideas for fabric trims. When asked how, out of the French Resistance in World War II, he emerged one of the leading fashion designers of the world, Féraud replied: "Fashion does not separate people but holds them together. One can also describe fashion as the meeting place out of love." In the mid-1990s Féraud turned the business over to his daughter, Dominique (known as Kiki), and his former wife, Zizi, who had remained his partner after their divorce. Kiki, like her father, was a designer, though the younger Féraud favored more detailed and ornate designs than the elder. In 1997 the Féraud ready-to-wear division was sold to Dutch textile group Secon. Three years later, in the fall of 1999, Secon acquired the remaining Féraud assets. Louie Féraud, designer, painter, and author, died in December 1999 at the age of 79.